Quinton de Kock hurt himself while batting and that forced AB to take the gloves in the four-day Test against Zimbabwe. AB de Villiers is undoubtedly among one of the best keeper batsmen in the world. His explosive batting has left many fans awestruck. His average and wickets scalped behind the stumps are almost at par with legendary keeper batsmen like MS Dhoni and Kumar Sangakkara. In spite of his astute skills as a gloveman AB has always chosen not to keep whenever given a chance. He kept for his IPL team ‘Royal Challengers Bangalore’ for the initial seasons but the team found other keepers. The same has been the case with the South African national team. 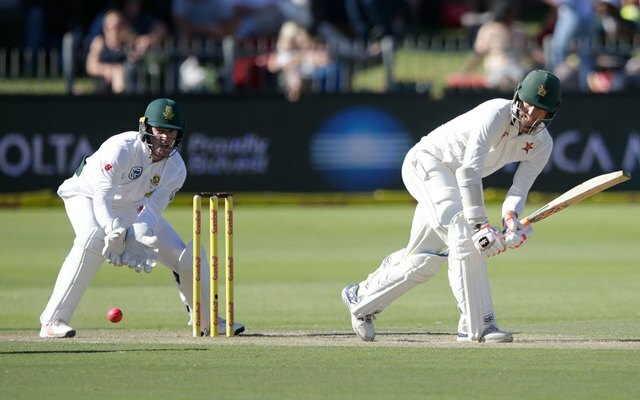 In the recent four-day Test between South Africa and Zimbabwe earlier this week, South African wicketkeeper Quinton de Kock picked up a hamstring injury while batting and was thereafter ruled out of the game. Therefore, AB had to take up the responsibility for both of Zimbabwe’s innings. Quinton was expected to recover for the upcoming Test series with India which is scheduled to start on 5th January, but it seems AB will have to take charge for the first match as well. Talking about the same, the South African star said that he will have a chat with the coach to see if they have a backup option since he aims to prolong his career. It is his dream to play and win the 2019 World Cup and wishes to remain completely fit until then. Every news and details of the South Africa vs India series on CricTracker.